Research & Education Association, 9780738612386, 312pp. 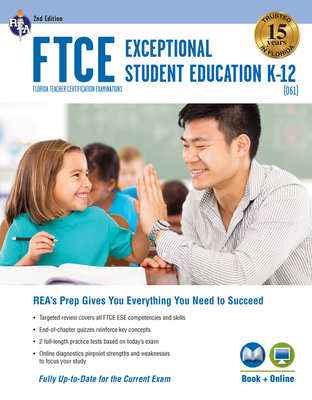 Fully updated to align with the Sept. 2017 exam changes, REA's test prep is designed to help teacher candidates master the information on the FTCE Exceptional Student Education K-12 exam and get certified. It's perfect for teacher education students and career-changing professionals who are seeking certification in Florida to teach students with special needs. Written by Florida education experts, our complete study package contains an in-depth review of all the competencies tested on the FTCE Exceptional Student Education K-12 exam, including knowledge of foundations of exceptional student education, knowledge of assessment and evaluation, knowledge of instructional practices in exceptional student education, knowledge of the positive behavioral support process, knowledge of multiple literacies and communication skills, and knowledge of the transition process. . Two full-length online practice exams run under timed-testing conditions and provide automatic scoring and diagnostic feedback on every question to help students zero in on the topics and types of questions that give them trouble now, so they'll be prepared on test day. The book includes the same two practice tests that are offered online, but without the added benefits of detailed scoring analysis and diagnostic feedback. This complete test prep package comes with a customized study schedule and REA's test-taking strategies and tips. Dr. Maryann Gromoll is an Associate Professor for Exceptional Student Education and Elementary Education at Daytona State College. She has been in the education field for more than 40 years, teaching exceptional student education in grades K-12 in three states. She was an Exceptional Education Teacher/Behavior Specialist in the Orange County (Fla.) School District. Dr. Gromoll is an active member of Teachers without Borders, leading student groups to where the need is greatest. She lives in Ocoee, Florida, with her husband, Kim. She has two children, Michael and Nik. Michael is a recent Florida State University graduate and Nik is a University of Central Florida alumnus.